Gain access to the world's fastest growing archive of bansuri lessons, compositions & tutorials - and two bansuri lessons per month with Dr. Kerry Kriger. Start Learning Bansuri and the Classical Music of Northern India Today. Pay Monthly Or Get Six Months Free When You Pay Annually. The bansuri is the transverse (side-blown) bamboo flute from northern India. World-renowned for its incredibly soothing sound, the bansuri is one of the world's most ancient instruments, having existed in more or less its current form for about 4,000 years. Your Bansuri Bliss Membership will provide you access to a large and growing archive of bansuri compositions, lessons & tutorials focused on conveying to you the intricacies of North Indian Classical Music and the beautiful melodies called ragas. As a Bansuri Bliss Member, you will be invited to attend two live online lessons each month, where you will learn new skills, meet other flute players and be able to receive direct input on your playing. With your membership, you will learn to play traditional Indian melodies in their pure classical form. You will expand your musical understanding and increase your enjoyment as well as that of your listeners. 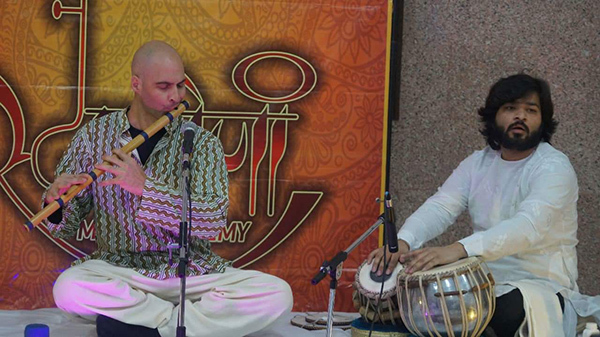 Given the complexities inherent in Indian classical music, most beginning bansuri players encounter significant difficulties becoming adept on the instrument if they attempt to learn it on their own. And due to the rarity of the instrument, finding qualified instructors or educational materials has always been difficult. Fortunately, bansuri players worldwide now have the ability to access a wealth of bansuri knowledge through the Bansuri Bliss Membership Site. The site was created by Dr. Kerry Kriger, who has been studying, teaching, recording and performing Indian classical music since 1996. The site is perfect for beginners and advanced players alike, as Dr. Kriger has designed the curriculum to start from the very beginning and progress through the playing of complex compositions and improvisations in a systematic way. What's the best way to hold a flute? How and when do I improvise? How do I get a beautiful tone? How do I read and write Indian music? Where do I learn traditional compositions or find written music? How do I play with tabla players (drummers)? How do I learn different scales and rhythms? How do I improve my rhythm and sense of pitch? How do I make my flute music sound Indian? Advanced students will benefit from learning compositions in a variety of ragas and talas (melodies and rhythms), as well as alap, taans, tihais and jhala (slow and fast improvistaions). The courses Dr. Kriger has created draw upon his decades of music experience to deliver bansuri knowledge in a way that is easy to understand, enjoyable and thought-provoking. Most importantly, the courses deliver results in the form of more beautiful bansuri music being played by the students who take them! As the vast majority of the world's bansuri players have received little to no formal training in North Indian Classical Music, all the ragas taught by Dr. Kriger begin from the very beginning and assume no prior knowledge of the melody. The lessons progress step by step, covering the foundational aspects of the music and the details of the particular melody, with an ultimate goal of enabling you to play a full-length raga that includes compositions as well as abundant opportunities to improvise. Dr. Kriger's teaching style is clear and concise, based on his 15+ years of experience teaching music, mathematics and sciences. Dr. Kriger has taught a wide spectrum of students, from elementary school to university level and beyond, and from a multitude of different cultural backgrounds. Any bansuri player interested in improving their skills and expanding their musical horizons will find the courses useful, whether they are brand new to bansuri or have been playing for decades. "Hi Kerry: Love your website and your dedication to teaching bansuri." Courses often also include recordings of the ragas being performed in the studio and at live concerts. The Bansuri Bliss Membership Site is aimed at bansuri (bamboo flute) players, but is well-suited to anybody interested in learning north Indian classical melodies regardless of their choice of instrument, as many of the concepts taught are broadly applicable across the Indian classical music spectrum. Get your questions answered and connect with other flute students during the live group lessons. For thousands of years, Indian classical music has been passed down directly from teacher to student, a tradition known as the guru-shishya parampara. This enables students to receive regular feedback from their teacher, which is critical for ensuring the student is playing the music correctly and improving rapidly. As such, Dr. Kriger leads twice-monthly online group lessons open to all Indian Flute Music members. (3) answers your questions, which you can submit in advance of the class or ask during the session. "The group lesson of today, was once more a moment of magic." In 2008 I built the Bansuri Bliss website (originally found at indianflutemusic.com) and started sending out regular electronic newsletters about bansuri. In 2013, I began uploading music lesson videos to the Bansuri Bliss YouTube channel and giving private and group lessons online and in person. Two lessons per month via videoconference and 24/7 access to a large and growing archive of on-demand lessons at one low monthly or annual membership fee. You can access the Bansuri Bliss Membership Site's large and growing archive of musical knowledge AND join the twice-monthly video-conference lessons with a monthly payment that is less than the cost of a private lesson...without even needing to leave the comfort of your own home. Your busy schedule probably doesn't allow you much time for commuting across town for lessons, or traveling across the country or to the other side of the planet to learn bansuri. And all that travel would be incredibly expensive! 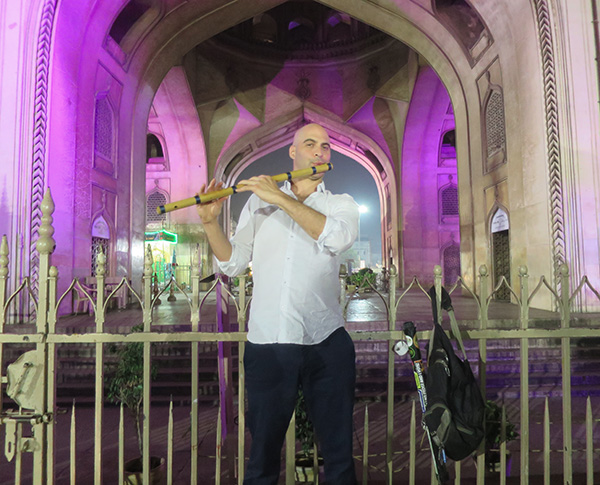 Dr. Kriger traveled extensively to gain the Indian musical knowledge; the Bansuri Bliss Membership Site allows you to reap the benefits of Dr. Kriger's long-distance commutes, in the form of at-home, on-demand learning suited to your busy lifestyle. "You are the real source to learn flute. Even being Indian, I haven't found a good teacher like you here. Keep uploading your videos. It motivates me a lot." When you sign up as a member, you will get a free half-hour introductory one-on-one online flute lesson with Dr. Kerry Kriger. You probably enjoy listening to mellow flute music at home, so we'll send you a free bansuri recording each month. You can download it and keep it forever! Bansuri Bliss Members enjoy a 10% to 20% discount on private bansuri lessons with Dr. Kerry Kriger. 5% gets donated to SAVE THE FROGS!, the public charity founded by Dr. Kerry Kriger in 2008. SAVE THE FROGS! has conducted over 2,000 educational events worldwide to benefit endangered amphibian populations, including a multitude of events throughout India, Bangladesh, Nepal and Pakistan. 5% gets dedicated to support bansuri students with financial needs, in the form of scholarships that help the students cover their Bansuri Bliss membership costs. Your membership helps fund these valuable programs and makes the world a better place...more nature, more music. The Getting Started With Bansuri course is designed specifically for those with no prior bansuri or musical knowledge. Included with every membership is access to the course “Getting Started With Bansuri”, which Dr. Kriger created to ensure you understand the basics of Indian classical music. 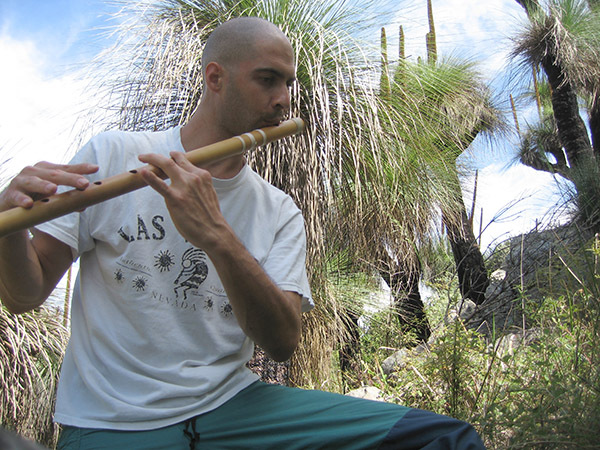 The course assumes no prior knowledge of bansuri and requires no previous musical training. Clear & concise teaching related to a wide array of bansuri and Indian classical music concepts. Compositions, exercises and a methodology for improvising, so that you can play an entire raga from start to finish. Knowledge of the most common Indian rhtyhms, such as teental, jhaptal, rupak, ektal and dadra. Musical literacy: knowledge of how to read and write Indian classical music. Downloadable PDF's with written music that you can keep forever. Access to twice-monthly live lessons led by Dr. Kerry Kriger. A free half-hour introductory private lesson with Dr. Kerry Kriger upon enrollment...and a 10% to 20% discount on subsequent private lessons. A free mp3 each month of exquisite bansuri music that you can download and enjoy forever. The joy of knowing that your membership supports environmental protection efforts and scholarships for financially-challenged musicians through our charitable giving program. A straightforward cancellation policy and our Bansuri Bliss Guarantee. I'm building the most comprehensive library of Indian classical music ever created. Your Bansuri Bliss Membership not only gets you access to it and regular online lessons with me, it also helps finance the creation of the library and thus the furtherance of Indian classical music and culture. Bansuri Bliss Memberships are a minimal but incredibly worthwhile investment in your musical future, at only about fifty cents per day. Please feel free to contact me with any questions!